Our first written Photoshop Killer Tip is about an application for Mac, called TextExpander, which allows you to expand custom keyboard shortcuts into predefined text (and pictures). TextExpander is a very useful app – in many ways. We use it for predefined text snippets in emails and social network messages, different email signatures or complex full text messages with placeholders. It’s also useful for numbers you can’t memorize, like your bank account, an address line you use frequently or even for coding. But of course, we do use it for Photoshop as well! When you create a non-destructive composing, you mostly have to deal with a lot of layers – DomQuichotte’s last composing had over 7000 layers! It really becomes necessary to rename this mass of layers, unless you want to get lost. Renaming is annoying, no question, and it sure can take some time. That’s where TextExpander comes into play! In simple words: you basically have two text fields. One for the shortcut, the abbreviation and another one for the expanded text, that will replace your shortcut. You can (and should) also set a delimiter, which can be a special character or key (space, return, esc) – we personally use # as a delimiter. Let’s say, we define db as the shortcut and Dodge & Burn as the text. Now, every time you type in db# (be it Photoshop, a browser or a text editor), TextExpander will replace the db# with Dodge & Burn. In the screenshot you’ll find some useful Photoshop relevant shortcuts. That was an easy example. Renaming my layer into Dodge & Burn definitively is better than something like Layer 86. I could e.g. 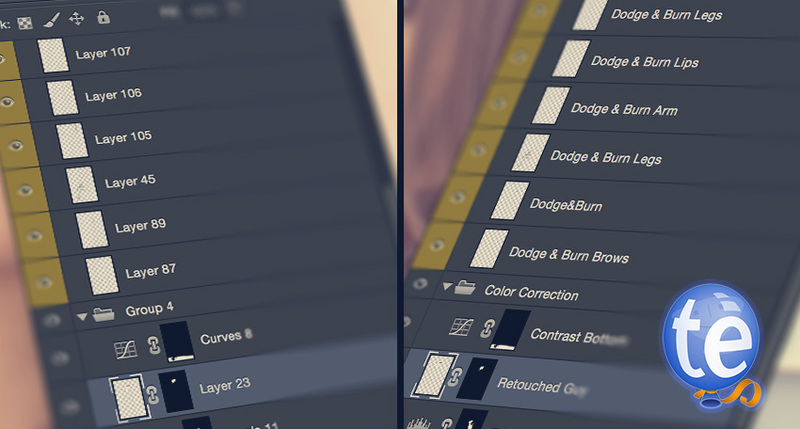 use the layer text search in Photoshop to find all layers named Dodge & Burn. 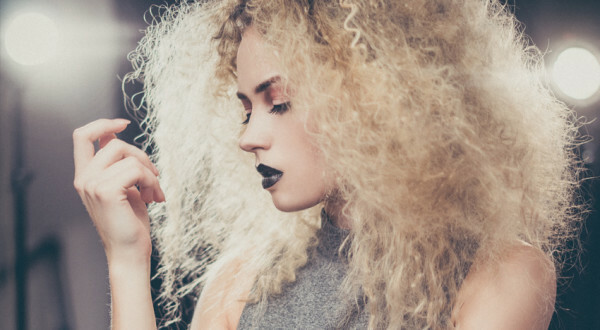 But let’s say you’re high-end retouching an image. You definitively will have a bunch of those Dodge & Burn layers. So you need to specify: is it an over all Dodge & Burn layer, is it for the eyes only, the face, the arm, leg, body… TextExpander allows you to add Fill-ins, which can be a single-line field, multi-line field or a popup menu. In the popup menu, you can add options. Let’s sum it up: you can create a shortcut e.g. dbm and replace it with Dodge & Burn plus an additional text from a popup menu. Isn’t that great? But of course, it doesn’t have to stop at renaming layers. If you’re using Photoshop’s Generator for image assets, you’ll be lucky to have some shortcuts for the file extensions including the specifications. That could be the shortcut j7 for .jpg70 or retpng for 200% imagename-retina.png, imagename.png. Additionally to a text replacement, you can also perform a keystroke (like enter or escape). We recommend to add the enter key, so Photoshop will automatically exit the layer’s text editing mode after you perform a renaming. You can also define the position of the cursor after the replacement, which is perfect, if you use the generator in Photoshop. You would start with the file extension shortcut j7, then bring the cursor to the front, so you can continue with the image’s file name. There are a lot more options, like pasting text from your clipboard, adding a picture, format text… but all these functions are useless for renaming layers in Photoshop. They do work perfectly for emails and messages, though! You can buy TextExpander for 35$ from the Smile Software website, which is nothing compared to the time you’ll save and the order you’ll keep. And if we couldn’t convince you, you can firstly download a free trial. Well, if you are a Windows user, I’m pretty sure there is something similar. We are aware of Phrase Express, but never have tested. If you are familiar with another application for Windows, please leave a comment! 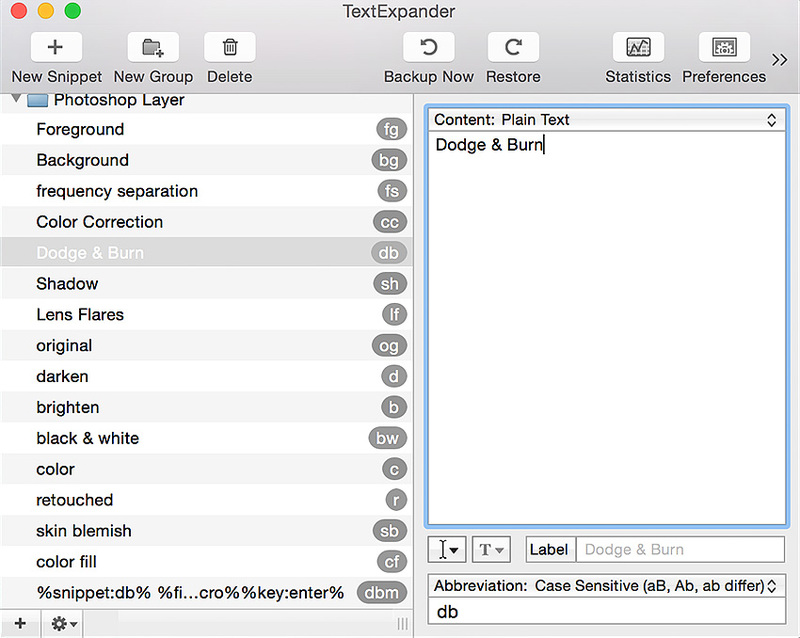 Let us know what you think about TextExpander and our method of renaming layers in Photoshop!